Need a Political Theory Refresher? The 8th Grade Can Help With That! All students are equal, but are some students more equal than others? The 8th grade Humanities class has been busy grappling with the big ideas and themes in the book Animal Farm by George Orwell. Reading and analyzing this novel gives us a tremendous framework from which to approach the global history of the 20th century over the course of this academic year. While reading, students jot down thoughts, questions, or epiphanies they have that could make engaging discussion prompts for our class. 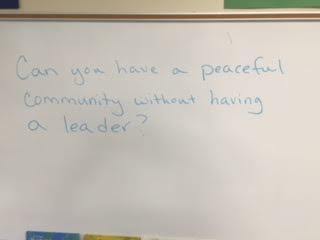 Without any background reading of Hobbes, Locke, or Machiavelli, the students have come up with amazing discussion questions such as, "Can you have a peaceful community without having a leader?" and "Does it matter if a leader is not respected if everyone is scared of him?" and "If the neighbors were scared of the spread of ideas, why didn't they just go over and put down the revolt?" Over the course of the last week, the 8th graders have participated in interesting and insightful discussions and debates about these challenging questions. Next week we will start to fill in the history behind the story of Animal Farm, and see how, and if, the students' thoughts evolve as we are considering real people instead of fictional animals.